Dr. Runnels was born and raised in southern Maine. As a child, she always enjoyed science and math and eventually majored in biology at Boston College. One summer, she worked as an orderly in the operating rooms of Mercy Hospital, where her mother worked as a nurse. She was introduced to many surgical specialists but was particularly fascinated by watching the oral surgeons perform jaw surgery. Sensing her keen interest, the oral surgeons invited Dr. Runnels to observe in their private practices. It was then that she knew she had found the perfect job for her! 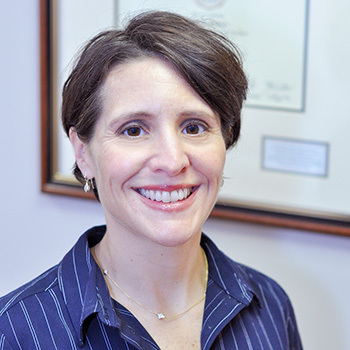 Following the surgeons’ advice and encouragement, Dr. Runnels attended Tufts University School of Dental Medicine, where she excelled in anatomy, physiology, and pathology. After graduating second in her class at Tufts, Dr. Runnels moved to New York City to complete her residency at the Columbia-Presbyterian Medical Center. During her six-year residency, she had the opportunity to go to the prestigious Columbia College of Physicians and Surgeons, she spent a year in general surgery, and she treated hundreds of wonderful patients, as she gained hands-on experience training in full-scope oral and maxillofacial surgery. After completing her residency, Dr. Runnels returned to her second home, Boston, to work and lay down roots. She joined Dr. Lawrence Herman of Neponset Valley OMS in 2003. Dr. Runnels is board certified by the American Board of Oral and Maxillofacial Surgery, which is the highest qualification for a surgeon. She is a fellow with the American College of Surgeons and with the International Association of Oral and Maxillofacial Surgeons. She is also a member of several professional organizations, including the American Dental Society of Anesthesiology, American Association of Oral and Maxillofacial Surgeons, and the Massachusetts Medical and Dental Societies. Dr. Runnels is passionate about volunteerism, both locally and globally. She participates locally with the Elder Dental Program and provides significantly discounted services and care to the elderly population who oftentimes cannot afford dental care on their very fixed incomes. Globally, Dr. Runnels was introduced to the care and treatment of children and adults with cleft lip, palate and associated deformities, as a chief resident. She participates in various medical missions with organizations such as Healing the Children, Global Smile Foundation, and Smile Train, on an annual basis. Drs. Herman and Runnels collaborated on chapters of a recent textbook on cleft palate and alveolar cleft surgery. Dr. Runnels lives in suburban Boston with her husband and daughter. As a family, they enjoy traveling, hiking, and arts and crafts together. When she’s not chasing her daughter around, Dr. Runnels enjoys swimming and staying physically fit. She has competed in four Ironman triathlons and multiple half-Ironman triathlons over the past several years. In 2018, Dr. Runnels was awarded Ironman Silver All-World Athlete status for finishing in the top 5% of her age group.